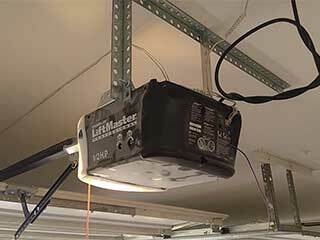 Over time, your garage door opener, which is a complex electro-mechanical device, is likely to fail. Our experienced technicians are highly trained and skilled at performing thorough and cost-effective repairs. We can help you deal with any accidents and mishaps that could be caused by a malfunctioning component. Garage door openers are identified by the type of drive system they use. The drives usually belong to one of three different types. Chain drive units are a convenient choice especially for homeowners looking for affordability and reliability, providing that they don’t mind a noisy operation. Belt-drive models can be excellent for anyone looking for a high-performance, near silent operation. Screw drive openers can be a bit loud, but are great for someone who is looking for a drive that requires a minimal amount of maintenance, and doesn't mind a little noise. Different manufacturers have different features they implement into their models. For instance, LiftMaster and Genie openers operate with rolling code technology, which changes the access codes every time the unit is used. This prevents hackers from hijacking your unit and exploiting it to access your home. Other things that modern opener models often include are Wi-Fi compatibility, a backup power system, and a whole load of other useful features. As the local experts for all things garage doors, our team is happy to advise you on the best model and brand for your needs. It’s important to regularly service your opener. Our skilled technicians carry out thorough checks, which include inspecting the trolley, circuit board, and the inner gear, and making sure everything is in good working order. If a component is defective, we'll fix it immediately, or replace it with a new, and improved part. Safety sensor realignment is another task we perform, and we will assess the unit’s photo-electric eyes to ensure your door switches into reverse when it detects an obstacle in its path. Here at Garage Door Repair Oceanside, we love helping our customers with any opener-related problems or questions they might have. Contact us today.